UPDATE: Parentin.tv I Love My Family event has been moved to FEBRUARY 6, 2011, SUNDAY, 2PM to 6PM. Give your wife or mom a make-over this Valentine's Season! Three (3) lucky moms will get a chance to win a total MAKE-OVER! Simply go to www.parentin.tv for the mechanics. * JOIN NOW! 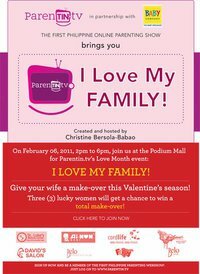 * Parentin.tv I Love My Family Make-Over contest is open to Parentin.tv members only. To qualify, simple register or sign up on our website, www.parentin.tv, to be a member. ** No online registration for the event. Registration will be done on the venue of the event. We would like to invite everyone to come and join us on Grand Baby Fair this coming January 28 to 30, 2011 at Megatrade Halls 2 and 3. Avail 30% discount on Philips AVENT item. Lots of activities and prizes awaits all..
A box of Circulan was an answer to my prayers. Being overweight had brought me hormonal problems. I don't have monthly periods on a regular basis. I never liked to take pills because it takes its toll on me. I would either have more appetite or I'll have extreme migraines if ever I'd be popping pills to regulate my period. When a friend of mine introduced me to Circulan 4 in 1, I swear I thought she's getting it all wrong. Why would I need a food supplement in the first place? But I tried it just the same, I figured there's no harm in trying it out. it wouldn't be approved by BFAD if it's not safe. When I started taking Circulan 4 in 1, I had no idea if there's gonna be some side effects. And yes, there was a side effect...I've observed I sleep earlier when I pop on the pill. And eventually, I was surprised that after about more than a year, I had my period back. Circulan even helped regulate my period. Now, i have no more worries...It was an answer to my prayers. I sleep well and I no longer have hormonal imbalance as I get my period regularly now. Thanks to Circulan. Circulan 4 in 1 is available in leading drugstores nationwide. A shot I had taken online from Nuffnang's site. It's only the beginning of the year 2011, and I am speechless with all the blessings I have received. This early I have so much to be thankful for. i won in the Nuffnang and Nutroplex Top of the Class Blogging Contest (Best Story)--It was something I had not expected in the first place because I thought I write too much. One blogger I know even said that she finds reading my blog posts really boring that reading them lulls her to sleep. I'm sorry if this is really the case, i just love writing so much that sometimes, there are tendencies for me to write really long blog posts. Anyway, winning that blog contest gave me some kind of confidence. It had given Kyle a Muji study table and chair and P8k worth of gift certificates from Fullybooked. The latter meant that I could finally regain the mini library that I had lost from super typhoon Ondoy in 2009. I had once blogged about losing my interest on books after my precious collections submerged in flood water--I could vividly remember how I tried my best to dry my books and save them with a hair blower--drying them page by page. Other hardbound books, I grieved and cried for them an entire week. God must have finally heard and answered my prayers, He had restored my interest for reading books again. Then, I had also finally repaired my mac mini. I've had it reformatter and upgraded from a Tiger 10.4 to a Leopard 10.5. As of this writing, I am still trying to adjust with its new operating system and with its new specs to boot--its got iWeb, Time Capsules, Space among others. I am forever grateful to Liza Abrigana for referring me to Ynzal Marketing after Apple's Power mac Center had denied me. And to Mr. Nomer, the technician who was very patient and helpful in answering my inquiries. Thank you so much! And to those who HELPED me big or small, I sincerely thank you from the bottom of my heart. 2010 had been a pretty good year for me. I thank God for Facebook as I've been able to trace and finally reconnect with old time friends of mine, friends i have loved and cherished since grade school. I thought I would never see them again. In January, I had the chance to meet with Jennifer Bucsit-Mesina when she went home from the US and we managed to have a small get-together with former neighbors and childhood friends, Grace Ramos-Arevalo and Helen Pagulayan-Norcio. It was nice seeing all of us together after more than a decade. 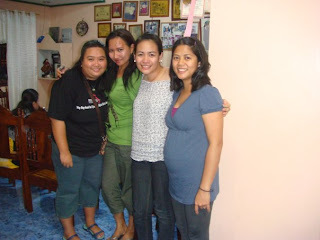 Moi, Helen, Grace and Jhing. 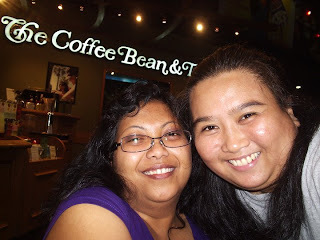 In October, I had a chance to meet up with another grace school friend, Rona Apostol. She was the same warm Rona that I knew from way back, with some distinct variations. For one, she now sports longer hair and sometimes speaks with an American twang, an indication of her long stay in the US. Too bad, I had not had the chance to bid her goodbye because I've gotten sick during her stay in the Philippines. As if that wasn't enough, another childhood friend Marisol Peralta also came home in December of 2010. We had the chance to organize a small gathering of friends and teachers close to our hearts. It was some sort of a reunion through Marisol's initiative. I had been lucky to see old friends like Fritziefil Tagalog a.k.a. 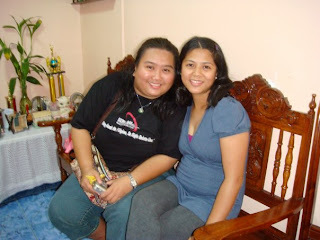 Ching Del Rosario,, Joy Olaivar-Almazan, and Joanne Tuanquin. The rest of the gang with Mrs. Martinez. What's more? I even made new friends in Mrs. Mila Martinez, Mrs. Villareal, Eric -Fritzi's beloved and Richard mark Soliven a.k.a. Don Soliven. It really felt good seeing all of us bond together. It's just like the old times except that we've pretty much matured not just in the way we look but also in wisdom. I had had a lot of fun that night that how I wish it never ended. But I know I could not perpetuate the moment. Doing so would mean not moving forward and seeing the bright future. As the calendar turns its last page, there lies a new beginning. Soon, Fritzi's about to give birth to another bundle of joy. Joanne and Rona would hopefully find the right guy for them, Joy and hubby will soon have their own baby, Mrs. Martinez' and Mrs. Villareal's health will be even better, Marisol will walk down the aisle--and for me, to hopefully wishing in all stars to lose weight. Looking forward for a new year...hopefully seeing all of you again in the next few years...God bless everyone! Our best defense against germs and bacterias. Toilet bowls are one of the dirtiest, most vile, most disgusting surfaces in the world. Fortunately, there's Holy Seat Toilet Seat Cover and Handy Sanitizer Spray. It doesn't matter whether you sit, squat, or stand, save yourself from the lurking evil in the bowels of the toilet. Just place on the seat of the bowl for the cover, or spray generously all over the bowl to disinfect for protection from disease-carrying invisible germs. That fast and easy. Now, we can all pee in peace. What's more? disposable seat cover is 100% biodegradable and made from wood pulp. Kyle with the famous green ogre, Shrek. Magnavision Home Video and Sony Home Entertainment present release of videos and Blu-ray animation film Shrek. The movie franchise earned nearly 3 Billion-dollars at the worldwide box-office and millions of fans around the world over have been waiting for the heartfelt conclusion of the Shrek saga. This holiday season audiences will celebrate the arrival of the ultimate gift as the complete collection of all four film debuts together for the first time. I just drank a bottle of Minute Maid Pulpy. They say it’s got ‘no preservatives added’. Aw, c’mon…It’s bottled juice. Is that even possible? So I thought maybe... I should give it a try knowing fully well that it came from a trusted company-the Coca-Cola Bottling Company. I didn’t believe it the first time I heard it’s got no preservatives added. So I read the ingredients (even the fine print) and everything checked out! It really has NO PRESERVATIVES ADDED! That means it doesn’t have ingredients that may turn out to be allergens, or worse...carcinogens! Whew! Now that’s healthy goodness that tastes so good, I... Yup, I began to realize that something healthy could actually taste good too. So okay, it’s got no preservatives added. That’s really good, right? Not just because it doesn’t have those icky, harmful ingredients, but it also means... I'm drinking something good for my body without any harmful ingredients or preservatives. So far anyone who still has a hard time believing that Minute Maid has got no preservatives added - meaning it's THAT natural, it's almost like it's plucked straight from the tree, it's just as Mother Nature wanted your orange juice to be, it's got nothing but the good stuff yes, none of those potentially toxic stuff that can harm your brain, kidneys, heart; cause tumors aargh- the list of preservatives' bad effects just go on!!! Anyway, just to prove a point on just how good Minute Maid Pulpy is 'cause it's got NO PRESERVATIVES ADDED, I'm gonna recommend all my friends and relatives to drink and guzzle down a bottle of Minute Maid Pulpy Orange drink daily!